What if the United States treated traffic violence like the public health issue it is? According to the Centers for Disease Control and Prevention, that would entail building bike infrastructure and slowing down drivers. Last week the CDC released a report on the long-term mortality rate among U.S. cyclists. The study covers 38 years of U.S. DOT data — 1975 through 2012 — when drivers killed 29,711 people on bikes. (Crashes not involving motor vehicles were not included.) During that time period, according to the CDC, the share of household trips taken by bike doubled. At the same time, the report says, mortality rates among adults aged 35 to 54 nearly tripled, from 0.11 to 0.31 per 100,000 people — though the overall age-adjusted mortality rate declined, owing to a 92 percent drop in deaths among children younger than 15. Indeed, the most dramatic declines in mortality rates from cycling have come among children, and the authors of the report speculate that “the decline in bicyclist mortality among children might be attributable to fewer child bicycle trips rather than a result of safer road conditions.” Among adults the good news is that recent (since 2000) large increases in the frequency of cycling by adults have not been reflected in higher overall mortality from cycling. But you can see the rise in cycling show up in the growing proportion of all traffic deaths that involve cycling (Figure 1). This figure implies nothing about the riskiness of cycling. We could see a growing proportion of cycling deaths relative to all traffic deaths merely because non-cycling traffic deaths have declined (which they have, but not as fast as in other countries). The CDC recommends that the U.S. improve safety through “multifaceted, integrated approaches to bicycling that address safety while also promoting cycling,” including physically separated bike lanes, traffic calming, and lowered speed limits. Elsewhere on the Network: Greater Greater Washington examines the upcoming overhaul of DC bus routes, The Urbanist maps Seattle sidewalks, and Getting Around Sacramento reminds the local paper that parking is not, in fact, a right. 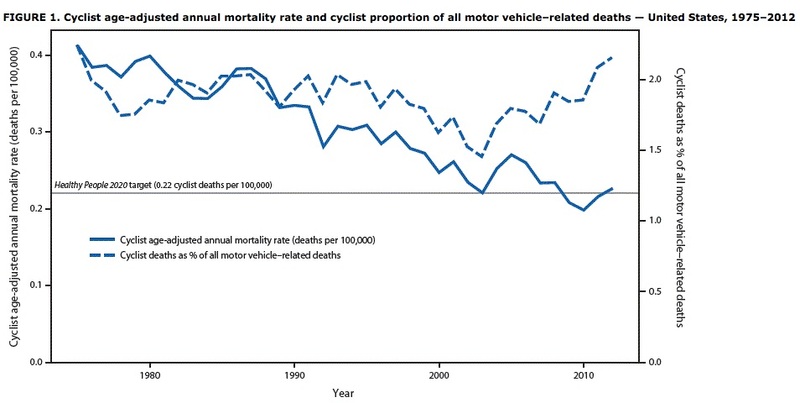 So, when the absolute data (fatalities per 100,000) goes DOWN radically over a 40-year span, the unneeded facilities spin doctor moves the goal posts and compares cycling deaths with motoring deaths. Why? Because they have gone down EVEN more and it looks like a spike in cycling deaths for the graph illiterate. And using aggregate deaths for 37 years ALSO makes cycling appear more dangerous than it really is.